This page refers to outdated, obsolete, or deprecated products or software. This is provided for historical reference for users of older releases. If you are a new user, please refer to the current Licensing Overview for up-to-date product information. There are two means of obtaining licenses for the LumenVox Speech Engine. One is to purchase them outright, and installthem locally on a License Server. The other is to purchase a subscription to the LumenVox-hostedSubscription Licensing Server.Instructions on using subscription licenses can be foundin our Speech Engine help document. The instructions below pertain to purchasing licenses outright and installing them locally. LumenVox licensing uses a client-server model. On startup, the LumenVox License Server creates a tokenpool based on the license file. The Speech Engine requests licenses and the License Server checks to seeif there are enough tokens available in its pool. If so, then the request is accepted and a token is sentback. One of the benefits of having a client-server model is the License Server may be configured to runon a remote machine allowing centralized control over available licenses. The LumenVox Speech Engine requires a valid license for each port -- each active connection between the Engineand a speech application. To determine whether a license is available, the Speech Engine queries anotherapplication, called the LumenVox License Server. The License Server can be running on the same machine as theEngine or on a different computer. If you wish to access a license on a different machine, seeclient_property.conf. A Speech Engine license is tied to the machine the License Server is running on. Setting up licenses consists of several steps. First, you generate a server ID file that will be used to tiethe license files to the hardware of your license server. Next, you will upload that file to our Web site,where it will be used to generate a unique license file that contains the licenses for your products. Finally,you will download and install that license file. The following instructions should be performed on the machine that will host your licenses. First ensure thatlv_license_server is running. Open a Web browser and go tohttp://www.lumenvox.com/customers/. Log inusing your LumenVox username and password. Please contact LumenVox support if you do not know your account information. You will be directed to a page to upload your server ID file. Select the Info.bts file you generated. You will then be redirected to the deployments page, and the "License Upload" link will have changedto a "License Download" link. Click that link to download the license file, and save the license. Type /usr/bin/lv_license_manager -m Licensefile where Licensefile isthe path to the licensefile you downloaded earlier. 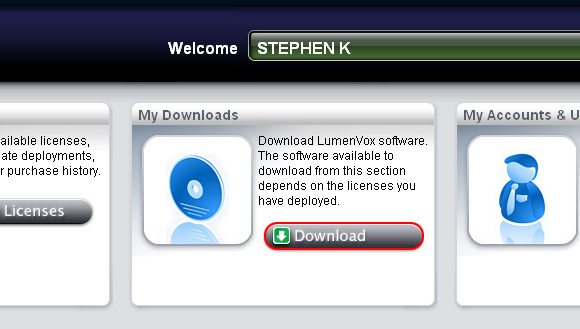 Once your license is installed, you need to configure the Asterisk-LumenVox connector bridge.